Revenue in the Baby Food segment amounts to US$644m in 2019. The market is expected to grow annually by 3.5% (CAGR 2019-2023). In global comparison, most revenue is generated in China (US$18,203m in 2019). In relation to total population figures, per person revenues of US$9.61 are generated in 2019. The average per capita consumption stands at 1.1 kg in 2019. Baby Food refers to nutritional products for infants and small children, most notably in the form of homogenized food preparations. In this segment both complementary foods (e.g. fruit and vegetable based mashes) and infant formula are included. Other beverages specifically marketed for babies are excluded. Reading Support Revenue in the Baby Food segment amounts to US$644m in 2019. Reading Support The Baby Food segment is expected to show a revenue growth of 5.1% in 2020. Reading Support The average revenue per person in the market for Baby Food amounts to US$9.61 in 2019. Reading Support In the market for Baby Food, volume is expected to amount to 84.3 mkg by 2023. 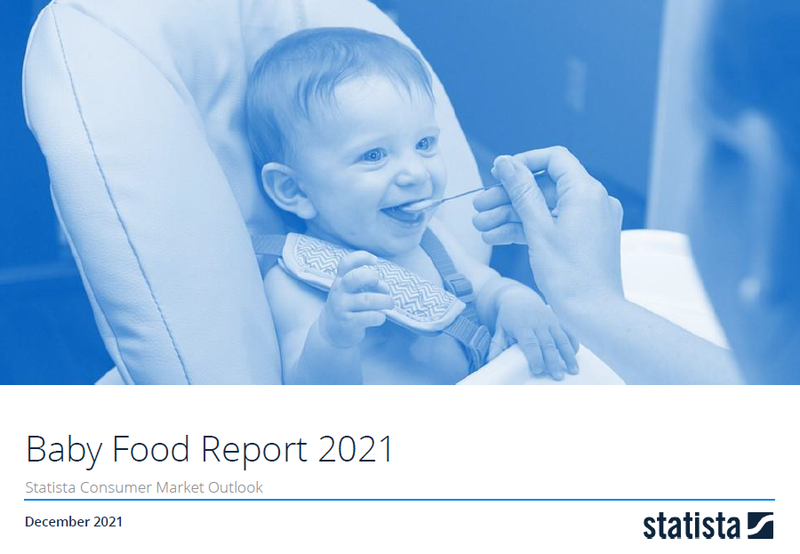 Reading Support The market for Baby Food is expected to show a volume growth of 3.6% in 2020. Reading Support The average volume per person in the market for Baby Food amounts to 1.1 kg in 2019. Reading Support The average price per unit in the market for Baby Food amounts to US$8.44 in 2019. Reading Support With a market volume of US$18,203m in 2019, most revenue is generated in China. Here you can find more studies and statistics about "Baby Food".